I've created a short video that describes why I wrote my book, Employee Development on a Shoestring, and how it can help. It has been estimated that 70 percent of employee development takes place through informal learning, rather than through formal learning events. 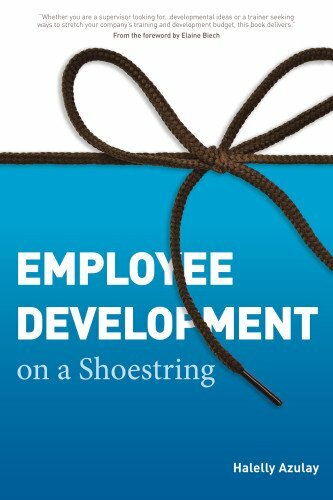 Employee Development on a Shoestring offers insights and lessons for leveraging these naturally occurring growth opportunities in developing employees outside the classroom and ‘outside the box’. This hands-on resource delivers specific implementation tools and techniques for developing motivated, engaged employees in today’s “do more with less” business environment. A handy resource for any employee developer, this book provides worksheets, checklists, and detailed implementation guidelines to help managers develop their workforce in a way that is tailored to each employee’s strengths, development needs, and constraints. Step-by-step guidance for initial goal-setting and preparation for effective development planning for every employee, for all development methods. Templates, worksheets, checklists, and guidelines to make your employee development efforts effective and sustainable. A discussion of the value of developing employees in ways that leverage and target their individual strengths, learning styles, and development needs. A modular, customized approach to developing employees by tailoring the development method to each employee’s unique needs and each organization’s budget and constraints. Ways to capitalize on self-directed learning ideas that are easy to implement and apply, immediately and cheaply. Insights for using volunteering as a low-cost and low-effort employee development method. Ideas for creating unique immersive learning opportunities by sending employees on a sabbatical. How to leverage the power of mentoring to develop new competencies for both mentors and protégés. The hidden value of job rotation, stretch assignments, and special teams for addressing your employees’ development needs while enhancing organizational results. Ways to multiply your return-on-investment by identifying situations where peer teaching opportunities exist. The secret of turning employee development into fun and engaging games and contests. Tools and techniques for developing employees by encouraging them to capture stories from the frontlines into digital content for everyone’s benefit. Why developing “innovation zones” within your organization may bring huge learning and development rewards. An examination of social learning and the use of multiple collaborative online tools for real time, on-the-job employee development. By offering multiple employee development methods for every learning style and budget, experience-based tips and suggestions, exercises, and input on maximizing the utility and efficacy of your employee development efforts, Employee Development on a Shoestring is a comprehensive tutorial for all managers, supervisors, trainers, human resources (HR) personnel, coaches, and other professionals who are involved in developing employee competence efficiently and cost-effectively. So - if you read the book, what are your key take-aways? If you have not yet read it, what intrigues you most about it? Please add a comment with your answers to these questions. And - if you know someone else who might find this of interest, please SHARE this post with them!